Did you know that wood-burning fireplaces cannot provide enough comfort and warmth? Undeniably, fireplaces can create heat that can warm your entire space. Heat loss is the only downside. Traditional wood-burning fireplaces have heat loss shortcomings and that’s pretty much annoying you can’t even imagine. Whether it’s a masonry or a factory-built fireplace, they are actually not that efficient, by nature. As the energy lost up in the chimney when they pull warm air out the room, about half of the heat generated from a typical wood burning fireplace is gone. Materials around the fireplace are the other factors that can make the warmth wasted. Such heating appliance can also drain more energy than what it provides when the temperature is dropping and that’s the worst. Here is why wood burning fireplace inserts came in. Fireplace inserts can transform your fireplace into a more efficient, stylish appliance with more benefits. Moreover, they look better than the common wood stoves. The value of this eye-catching heating equipment is a big thing if you want to leverage money savings. Since it provides the best heating efficiency you need, you can reduce the amount of time, energy and fuel you put into the fireplace for heat. This wood heating hero has a lot more to offer. See how top wood inserts can create wonderful fireside memories – amazingly! To make sure your purchase won’t end like a nightmare, allow us to give you some tips on how do it better. Consider a few important things below. 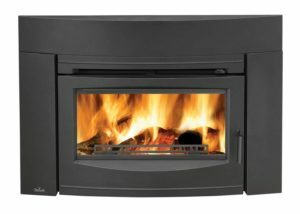 Gas fireplace inserts use natural gas or propane to run. Since they can easily be hooked up to your gas lines or propane tank, they can be a great option for your home. Models in direct venting design are capable of taking in and releasing out air through the chimney. They can also be the safer and cheaper option to consider. Gas fireplaces are good, but roaring a fire with inserts is better. However, carbon monoxide poisoning is the biggest concern about gas inserts. You cannot see or smell the carbon monoxide when you’re using such heating thing to heat the home, but frequent exposure to it can ruin your entire health in minutes. Checking for leaks in the gas line can also be difficult with gas inserts as you will need to buy a carbon monoxide detector for an additional expense. Replacing a drafty masonry fireplace with heating appliances like this can be a great alternative for a cozier home. They come with traditional and contemporary design options in big or small sizes to suit your lifestyle and budget. Pellet fireplace inserts are the other type of insert that can heat your home while saving the environment. They are considered to be quiet and cost-effective and are designed to use renewable energy to provide safe and sound warmth. 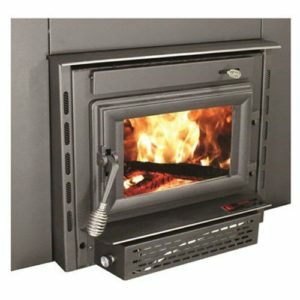 This prefabricated heater is capable of sliding into your existing fireplace to offer an efficient energy cost. 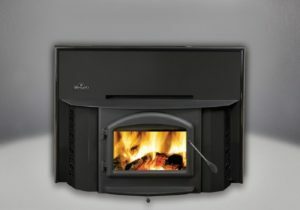 If you want to experience an even more comfortable fireside, you may use renewable fuel as what pellet insert provides. Heating appliances like this allow you to pour in pellets instead of loading logs. Typically, such fuels are made of compressed sawdust or any other agricultural waste from crops. Heating the house with such renewable energy source is very much human and environmentally sound. However, this type of insert needs electricity to make the automatic hopper run and you will need a yearly professional maintenance as pellet equipment contains fussy parts. They also come in different styles to match your home design. Electric fireplace inserts can be a great option for people who are living with less time. All you have to do is to plug the unit, flip the switch and embrace the heat. This time-saving heating source is completely powered by electricity, hence the name. You don’t need the use chimney ventilation with this, but you need to have enough electrical supply to power the thing up. As when the electricity is gone, your fire is gone. That’s how it works. Electric inserts can be a decorative piece as you can see flames glowing on artificial logs. This electric appliance doesn’t anymore need an electrician to wire it up. You just have to find an outlet and plug it in, a thing that even a beginner can do. So, if you’re bungling electric fireplaces ruined your day, allow inserts to help you. Gel fireplace inserts are commonly used with fuel that is typically made of alcohol substances. The fuel is designed to be environment-friendly while assuring a longer burn time. This heating thing is clean and functional. As the gel burns cleanly, it does not give off any bad odor or require the need for a ventilation system. Gel inserts come in several kinds and its fuel is made in different ways as well. There is thicker gel for long-lasting flames and thinner ones for hotter and brighter flames. This is also an easy-to-use heating appliance which can be used indoors without any adjustments. However, larger homes may find the unit not that functional as each can of gel last for only two to three hours. This means that you can use several cans of gel at a time to heat a room for several hours. Each can gives about 3000 BTU per hour, so gel fireplace inserts are less effective in terms of space heating, even if compared with a tiny wood stove. Wood burning fireplace inserts are matchless in a way that they are powered by wood, something that can only be found around the backyard. Since a traditional fireplace can only produce about 50% of heating efficiency due to heat loss issue, inserts are created to solve the problem. You can use them with your existing fireplaces to produce enough warmth minimizing the heat loss while giving a rustic feel around. This will also allow you to enjoy the beautiful fireview even without the presence of an electrical power. There are a lot of wood burning inserts to choose from. There are wood burning fireplace inserts with blowers too. Units like these can be a great option if you are looking for heating pieces with improved performance and a blower in a box. To make sure your wood burning insert fits your fireplace, measure your firebox and consider the sizing or dimension of your insert too. Measuring is important so you can get a piece of heating equipment that perfectly matches the size of your existing fireplace. Inserts come in different sizes, designs, and finishes. Before buying one, make sure the one you choose should tightly fit inside the firebox without having any extra space around the fireplace opening. It is good to measure the firebox first before you begin looking for the best insert of your choice. Check the depth, length, and height of your fireplace’s firebox as this will be the basis for your insert to match. When measuring for an insert, have the firebox to mantel distance and consider the height of the front opening. Measure also the back width of an insert, the depth from front to back and the width of the front area. If you find it difficult to do, you may consider installing an insert into a factory-built or pre-fabricated fireplace. Don’t forget to check what types of heating appliance compatible with the pre-fabricated thing to make sure you can find the one that works. Venting is vital to keep your fireplace inserts function properly. If you try to install inserts without using any venting components, they are not able to keep a fire. So, before buying any wood heating equipments, have them with all the venting components. You may vent your appliance using flex pipe that is vertically placed on your chimney. Inserts commonly have a 6 inches diameter flue collar right on their top side. To make it vented, you will need a flexible stainless steel liner in a 6-inch diameter and run it from the top of your insert into the top area of your chimney. The flexible liner comes in different types. You can choose anything you want. To connect the liner to the insert, you will need an adaptor. You also need a collar plate in order to cover the chimney opening. You can also use this to support the liner itself. One other thing you will need is a cap. However, there is a complete venting package deal in the market nowadays in which you will get an adaptor, a liner, a cap and a collar plate all in one purchase. When it comes to venting, insulation is strongly recommended. You need this for the steel liner to work better in your chimney. Pre-cut insulation blanket kits can also help to complete the insulation process. Buckets – Buckets are capable of holding coal. They can also hold fire starters and kindling to make a fire. It is good to include buckets close to your heating appliance for an easier heating experience. Gloves – Gloves are commonly made from durable leather and are able to resist heat for safe and sound heating. Gloves have usually been extended to the elbow to prevent any accidental brushes that the wearers may get due to the flying sparks or hot metal. Stove fans – they are used to spread the heat evenly by circulating the air. Cleaning Products – Cleaning products come in different kinds. They are made to clean the dirt and grime in your inserts. There are products that can control the smoke and soot in your house too. Regular maintenance should be done to keep the unit working for years. Kettles and Steamers – Kettles and steamers are designed with cast iron or aluminum materials. Most of them are coated with enamel and are often created with open, filigreed or decorative lids allowing the steam to escape attractively. Rugs – The primary use of rugs is to clean the mess. However, they can also create an eye-catching look while helping in protecting the fire from burning the house. You can buy rugs in different colors, designs, and patterns. Make sure to buy one that is designed to be fire-resistant and made to last. Fire Starters – To start the fire in your heating machine, you can use fire starting liquids, flammable paste pots or solid fire starting sticks. Others use long matches, thin wood or pine cones. Consider fire starters before buying wood heating units as you can’t make a fire without them. It’s hard to choose the best product when there is a wide range of choices. It’s even harder when everything you see in the market claims to be on top. We did a meticulous research to help you with that. Here are the top 5 wood burning fireplace inserts we’ve found that won’t let you down! Napoleon Oakdale EPI3 is a natural vent wood insert created with an airwash combustion system for quick and easy cleaning. 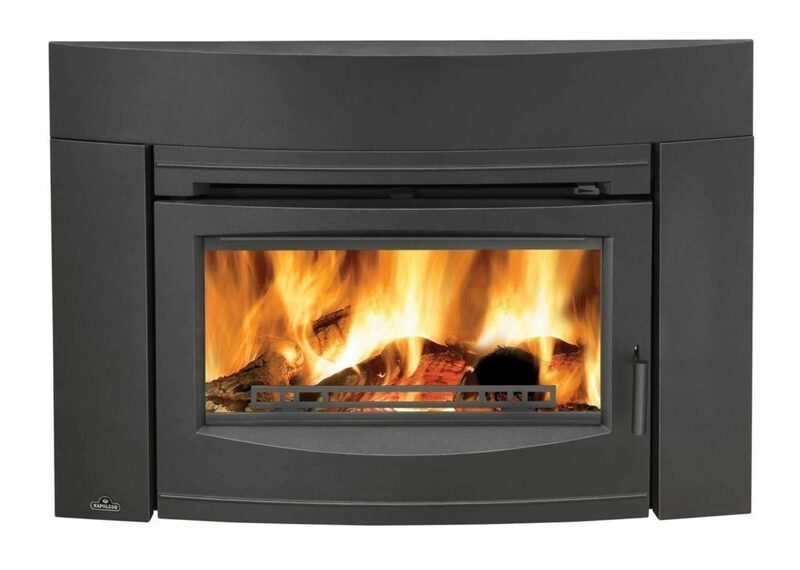 Its high-efficiency system is great for keeping the temperature consistently safe and going while allowing you to clearly view the fire as the airwash combustion system makes the viewing glass clean all the way out. This unit offers up to 55, 000 BTU’s heat output enough to heat up an average house. This insert is made of cast iron for durable and long-lasting use. This thing also offers versatile installation options since it has a beautiful, slim and low-profile design with a contemporary black finish. You can find this fireplace insert presentable in this modern day no matter what your house design is created with. The heating capacity of this insert can reach up to 1.8 cubic foot without worrying about the dangerous smoke because Napoleon Wood Burning Fireplace Inserts are EPA certified. The efficiency of this appliance is high and that is one of the best features this kind of insert can give other than great cost savings. The insert is lined with firebox blower kit for an even heat distribution. If you have everything going, the blower only takes about 15 to 20 minutes to activate. However, the blower takes at least an hour for a cold start. You will find it safe because it does not start until the insert triggers the switch on the blower panel as the unit reaches a high temperature. Having this Napoleon wood burning collection is great for daily heating needs. It is designed with contemporary flush front surrounded by cast iron construction to give your home an eye-catching décor. Vogelzang Colonial Wood Burning Fireplace Inserts have met EPA requirements making them an EPA certified intended for all wood burning appliances while producing pretty low emissions. It efficiently produces heat up to 1, 800 square feet at the same time. It is made of cast iron door with cool-touch wood handle for convenient handling and air washed ceramic glass window measuring 16.5” x 9” for a wonderful burning fire view. This unit offers up to 8 hours burn time on a single fueling which means you can get warmth throughout your bedtime. This Colonial fireplace insert is made with heavy-duty gauge measuring 3/16 inches that come with plate steel materials and firebrick lining construction. This insert is designed with large hearth that adds a classic look to the whole piece while giving an ultimate heating performance for your entire home. The hearth measures 31” x 44”. If you need an air tight fireplace insert that perfectly fits in your existing fireplace while improving its efficiency, Vogelzang TR004 can be a great choice. An insert like this can be a beautiful addition to your existing hearth with only 4.02 grams per hour emissions. There is more than 75% efficiency in this thing with 69, 600 BTU rating. Worry about the safety? This insert has been safety tested following the UL standard ranging from the year 1482 to 1996 to make your daily heating absolutely worry-free. Vogelzang TR004 is also packed with Hearth Surround used to fully enclose the existing fireplace with a spring loaded automatic adjustment for an easy installation process. Logs measuring up to 18 inches in length are acceptable in this insert. 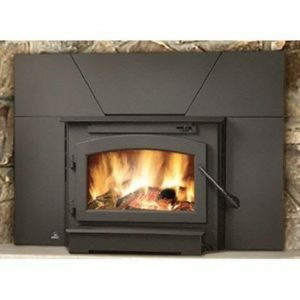 If you’re looking for a wood burning fireplace insert with blower, look no more because Vogelzang has a blower included. Consider an upgrade and you will get a great wood burning fireplace inserts with a chimney liner lit, top plate, chimney cap, and an appliance adapter. The Vogelzang manufacturer aims to serve you best that’s why all items are provided with sufficient return policy for any damages or defects at their cause. Napoleon EPI-1402P is created with metallic cast iron door that has been arched tightly into the unit with matching spring door handles for easy and flexible door closing and opening. It is designed with a fully refractory firebox in order to keep the interior temperatures achieve complete combustion and produce low emissions. To keep the viewing glass clean, there is an airwash feature to help the cleaning even more effective. This unit offers economically 6” flue to give you an ultimate efficiency plus quick and easy installations to save you time and energy. The non-catalytic design of this product is in high-technology advantage and is capable of eliminating the need for the ceramic catalytic combustor. Ceramic catalytic combustors are delicate and may deteriorate in the long run. If you have masonry fireplaces that are not efficient, this insert can solve the issue. 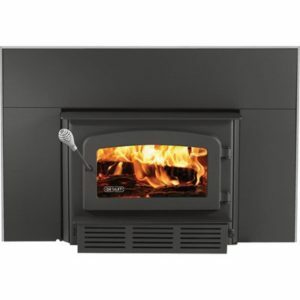 Napoleon EPI-1402P offer easy operation while providing clean burn fires and a massive amount of heat by just using a minimal amount of wood and effort. This insert can be a perfect fit for your existing fireplace with stylish design to bring you beauty and satisfaction that lasts. These fireplace insert products come with surround and trim together with 2 powerful CFM blowers for complete air distribution. In addition to the blowers, this unit is also packed with single lever burn control which can be operated easily in order to normalize primary and secondary air. Having such control can help in establishing a perfect mixture while giving a clean and safe burning. This product provides large viewing area and is an EPA certified. It features secondary air tube to make sure the complete combustion is achieved. The said cast iron door is elegant and is packed with the presence of standard flashing or surround to cover the fireplace opening of up to 32” H x 44” W measurements. By giving a beautiful, natural fire with matchless efficiencies, wood burning fireplace inserts with blowers like this are perfect. When you buy the product, you can get President’s Limited Lifetime Warranty. Heating Capacity: 1,600 sq. ft.
Drolet Escape 1400 is another EPA certified unit that generates 60, 000 BTUs and provides up to 1, 600 square feet heating capacity. This insert features airwash ceramic glass for a crystal-clear view and firebrick lining to protect the steel secondary air system of the unit. The firebrick lining also provides smooth heat radiation for you and for your family. For you to close and open the door with comfort, this unit is designed with tough door latch together with its large fire viewing area. You don’t need to buy a separate blower anymore because this unit comes with a standard blower for a perfect home heating experience. 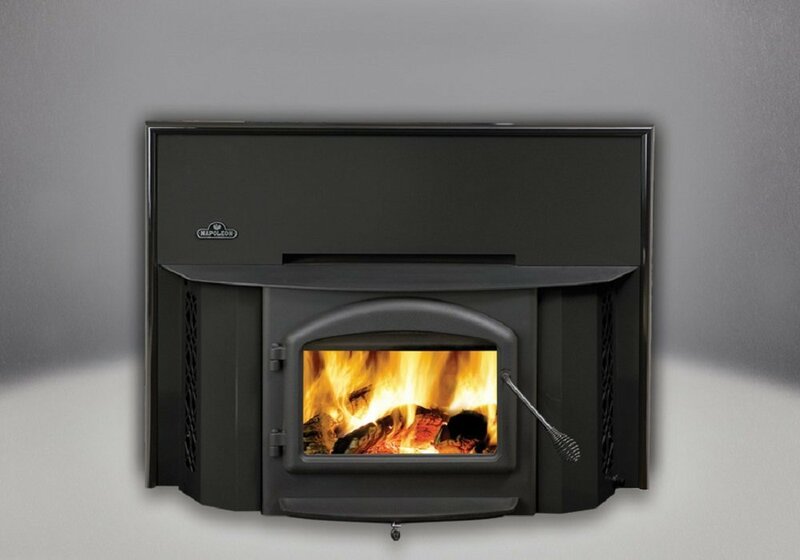 If you want to revive your old masonry fireplace in a very affordable way, Drolet Escape 1400 offers high-heating efficiency reaching up 75% for no more than $1500 price. This high-efficiency metallic black insert provides low emission that only takes 4.3 grams per hour. It offers high-quality vermiculite baffle and secondary air system made of stainless steel for improved gas combustion. Since the firebox is lined with refractory bricks, rest assured you can get better heat distribution throughout your entire house. Upon installing the product, you need 6 inches chimney diameter. To evenly warm up the interior of your house, consider buying this Drolet’s fireplace insert with high-quality 130 CFM blower packed with variable speed heat activation. This one offers 5 to 8 hours full load burn time without compromising the quality of the heat. Assembly is required in this thing but you will never find it hard. Logs measuring 20 inches in length are acceptable in this insert. When you buy this product you will also get a blower, stainless steel liner kit, insert the connector, top place, a chimney cap and a faceplate with nickel trim kit. With these features and inclusions, you can greatly upgrade your fireplace from messy to clean burning and from low to a high-efficiency heat source. Timberwolf Economizer is one of the best Napoleon masterpieces featuring 86% efficiency rating for outstandingly great heating. It can heat up an area from 800 to 2,000 square foot and can generate up to 65, 000 BTUs. It comes with long-lasting firebox packed with full refractory lining. It has been designed with large ceramic glass for convenient viewing area with door made of cast iron to give you comfort on getting in the logs and getting out the ashes. This unit has been certified to be good by EPA and since it has passed the test, you as human and your environment are get protected. This will give you a peace of mind while using the product. This insert needs a venting pipe with 6 inches interior diameter to make it work a lot better. There is a wide range of venting component options to look for and make sure to pick a venting pipe that fits the unit. The wonderful BTU rating of this fireplace insert has been tested through the use of hardwood logs with regular refueling. It has 1.9 cu. Ft. firebox capacity, 8 hours full load burning time and low emission that only takes 3.6 grams per hour. The whole piece only measures 14 x 25.9 x 22 inches and only weighs up 291 pounds. Having this environmentally friendly fireplace insert provides the best efficiency you need without sacrificing the ambiance. With it, you can enjoy real warmth from a real wood fire while reducing the heating costs. Timberwolf is designed not just to protect the environment but also to give your house a beauty that lasts from generation to generation. Its unique classic style in all attractive black finish is an adorable look that can enhance any home setting. Its efficiency rating is very much impressive and proves the insert to be more efficient than any other EPA approved inserts at this price range. Once you start using this new accessory, you will see how your heating bill is reduced while keeping the warmth going. The price of this thing is quite a bit lesser than high-class inserts people used to but the quality is unbelievably top class than any other kinds. When you buy the product you will get two 55 CFM blowers that come with speed control and automatic thermodisc. Flashing and trim are included in the package as well together with Limited Lifetime Warranty. Enjoy and relax during cold seasons with Timberwolf Economizer without breaking the bank! It’s still will be more expensive than a cheap wood stove, but it will be definitely more stylish. If efficiency rating matters a lot to you, we recommend Timberwolf Wood Burning Fireplace Insert. This insert pretty gives 83.9% efficiency, the highest among the others on the list. Considering the efficiency of any wood burning units you purchase is important as it shows how well the thing can deliver useful heat around. The distribution of the heat matters a lot because that is what heating appliances are used for. Having 83.9% efficiency rating is more than enough to prove how effective the equipment can be at a price that’s everyone can afford. The Timberwolf insert is a bit small and lightweight. It is perfect for limited living spaces. On the other hand, Napoleon EPI-1402P is perfect for bigger houses as it provides the highest heating capacity in which it can reach up to 2,000 sq. ft. and also provides the highest heating output which is up to 70,000 BTU’s. Heat outputs like this provides about three times higher than the average house requires. Having such heat capacity also shows how well this equipment can supply heat. Since this fireplace insert can provide more heat, it is also a great option to jump off. One other thing we recommend for people looking for heating equipment with the least emission production is Napoleon Oakdale EPI3. This unit only gives off 2.8 grams per hour emissions and it’s the lowest of all the items listed here. Efficient products should have cut emissions. Heating appliances are required to meet EPA emission requirements to be regulated and certified by the EPA. Once the unit has been qualified and certified, what you will get is not just worth the money but gives you assurance to burn more cleanly. This insert model is pretty much qualified. To make the pick easier for you, we gather the best feature each of the wood burning fireplace inserts (mentioned in this article) has to offer. Timberwolf Wood Burning Fireplace Insert for the highest efficiency rating. Napoleon EPI-1402P for the highest heating capacity and heat output. Napoleon Oakdale EPI3 for the lowest emission productions and clean burning. Drolet Escape 1400-I for the longest log size accepted. Vogelzang TR004 for the most affordable option. People use wood-burning appliances to heat their homes. To set yourself above them, be wise. Saving on heating bills is enough to justify the efficiency of a fireplace insert. Old-Fashioned heating units aren’t really an efficient heating source, inserts do. Fireplaces loss up the heat, inserts do not but rather generates heat that every corner of your house will benefit. Unlike traditional wood-burning fireplaces, inserts can amazingly cut your energy bills without creating high levels of smoke in and out your house. This incredible wood-burning heating partner can create a more beautiful fire; offer a more comfortable heating and convenience that a simple fireplace can’t provide. Its efficiency and eco-friendly approach can offer heat that can be used from generation to generation. When choosing for the best wood burning fireplace inserts, consider the emissions, efficiency, size and the accessories it is made to come with. All of the above options are EPA certified. All of them can catch the attention of your eyes. All of them are in the detailed list for your own ease. Ready to upgrade your fireplace? Check for the options above and experience amazing heating machines that are priceless!